Home / Notícias (News) / Notícias Internacionais / Turnês / SATARIAL added new dates for 2018 European Tour! 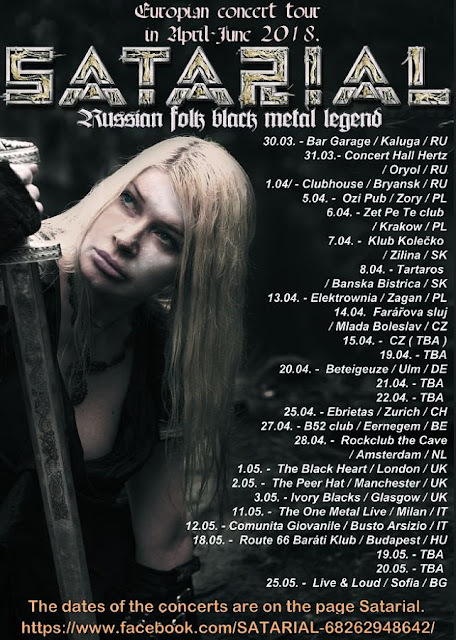 SATARIAL added new dates for 2018 European Tour! Russian Folk / Pioneers Black Metal SATARIAL going to Europe in April-June 2018! New dates added! Concerts AMSG took place in absolutely underground atmosphere: abandoned churches, warehouses, basements etc The court USSR recognized the activity of a band how anti-Soviet and fascistic. The name of the band and her music were prohibited. Seth was sent to the psychiatric clinic. And the rest members of the band - into the army.